The New Pioneer CDJ 2000 Nexus is here! At $2399 – It’s not cheap but it’s here. In recent years, the DJ/club market has seen the music file style of DJing become the mainstream, with increasing demand for music management and DJ play using smartphones and tablets, as well as browsing music on large tablet screens. In order to meet these needs, Pioneer will launch the pro DJ/club oriented “CDJ-2000nexus” Professional Multi Player, which is the Industry first*1 player to enable DJ play using music stored inside smartphones and tablets via Wi-Fi*2 or USB connections. By installing the newly developed mobile version of the “rekordbox™” music management software, music can be prepared and managed not only at home but also on the move, with the prepared music then transmitted as-is to this device for DJ play. Pioneers “CDJ series” Multi Players for DJs are supported by many DJs for their excellent operability and reliability, with machines permanently installed in many celebrated clubs around the world. 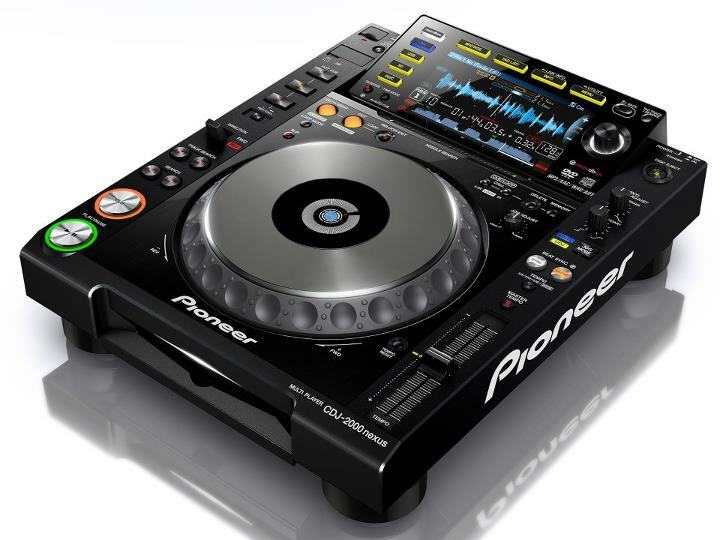 Among these, the “CDJ-2000” (launched in 2009) in particular has become the de facto standard model for DJ equipment. The “CDJ-2000nexus” inherits the basic functionality and operability of the “CDJ-2000/CDJ-900” while also introducing new evolutions, such as a selection screen GUI that makes music searches more intuitive, improved visibility of the needle search pad for use in dark places, and improved master tempo sound quality, etc. It is also loaded with new features for more aggressive DJ performances, including “BEAT SYNC” for automatic beat (beats and tempo) matching of both tracks being mixed, a “WAVE ZOOM” display giving a more detailed understanding of how the music is progressing, and a “SLIP” feature that enables reliable performance without breaking the rhythm of the original music. Music stored inside Wi-Fi/USB-connected iPhone/iPod touch/iPad devices can be transmitted to the “CDJ-2000nexus” using the iOS version of “rekordbox™” (available on the App Store free of charge) for DJ play. The touch panel displays of iPads, etc. can be used for intuitive music selection with controls that users will already be familiar with. In addition, the enclosed Mac version of “rekordbox™” can be used to send music to the “CDJ-2000nexus” from inside a Wi-Fi-connected Mac. Also, when connecting via USB, the device can be charged during DJ play. 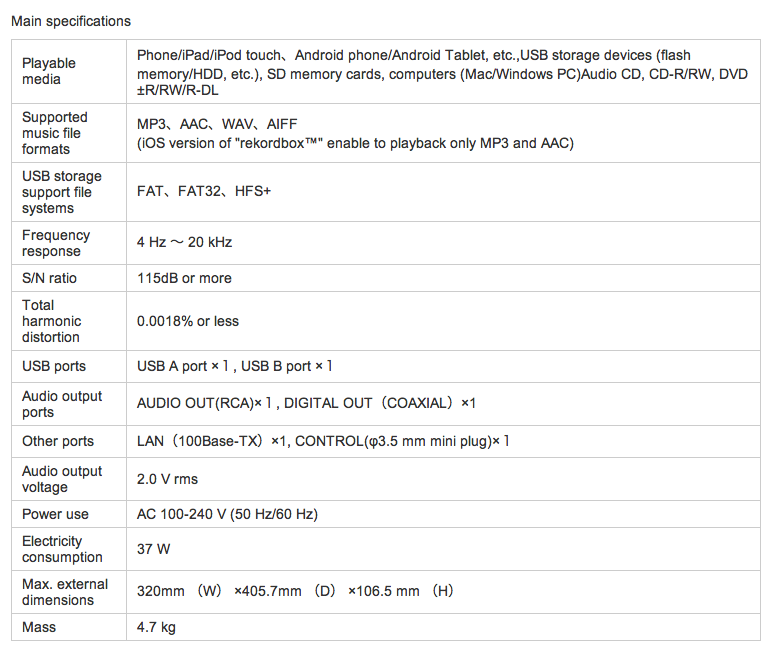 Android OS devices can send music via Wi-Fi/USB connections using the Android version of “rekordbox™” (available on the Google Play free of charge), and music can also be transmitted from Windows PCs via Wi-Fi connections using the enclosed Windows version of “rekordbox™”. Music files can be analyzed with “rekordbox™” installed on a computer, music can be managed (settings, create/edit, save logs) in the optimum way for DJ play, and the music to be used can be prepared in advance. The “CDJ-2000nexus” features new music file analysis functions such as “WAVE　ZOOM (waveform expansion)” and “KEY” as well as new “ACTIVE LOOP” and “HOT CUE AUTO LOAD” settings. (i) Data analysis of music files “WAVE ZOOM”, “KEY”, “WAVE”, “BEAT GRID”, “BPM”, “ID3 TAG”, etc. By connecting multiple players (up to 4 units) with LAN cables, various new functions have been added to expand the scale of DJ performances alongside the existing content-sharing functions. Music being played by any players connected with “PRO DJ LINK” can be matched in a single action to the tempo and beat location of music being played by other linked players. In relation to the key of music being played by any players connected with “PRO DJ LINK”, consonant music is displayed in blue and is therefore easy to find. Information from “BEAT COUNT”, which accurately understands the number of beats until a set point (MEMORY CUE), and “PHASE METER”, which shows the beat/bar of the music, can also be displayed simultaneously on other players connected with “PRO DJ LINK”. The “CDJ-2000nexus” adopts a large 6.1-inch full-color LCD to clearly display information that is required when performing DJ play. Music artwork and large quantities of music information are displayed in lists, and the intended music can be found easily and intuitively. In addition to the existing “WAVE” display that provides a visual understanding of all music, “WAVE ZOOM”*5 makes it possible to instantly grasp the preceding music development by displaying waveforms that can be expanded/minimized to five different levels color-coded according to bandwidth. The “SLIP MODE” function keeps music moving in the background during LOOP/REVERSE/SCRATCH/HOT CUE/PAUSE. This makes it possible to produce bold musical arrangements without changing the progress of the original music even after these functions have been used. The “CDJ-2000nexus” is loaded with a QUANTIZE function that automatically and accurately quantizes when using LOOP/REVERSE/HOT CUE, even if the dynamic of the beat has gone out of sync. This enables reliable performance without breaking the rhythm of music during playback. The function settings of this device can be saved to USB storage devices, SD memory cards, smartphones and tablets, and can be applied to this device as necessary. In addition, “CDJ-2000nexus” settings can be made on “rekordbox™” and sent directly to this device, which means that you can instantly switch to your own settings when prepared in advance when alternating DJs. A new algorithm has been adopted to deliver sound quality that is more faithful to the original tone, even when there are drastic shifts in tempo during playback of wide-ranging music. This enables high-quality mix playback even when there is a big difference in track tempo. While inheriting the audio circuit from the “CDJ-2000”, this new device delivers a powerful sound that is stable even in high-volume environments such as DJ booths by means of improved anti-shock properties and reduced contact resistance through the adoption of a type of AC inlet that has a large power cable contact area. A clear and powerful sound that is faithful to the original has also been realized by reducing jitter to ¼ through the high-precision engineered clock of a high-performance D/A converter produced by Wolfson Microelectronics, adoption of a high sound quality operational amplifier, and digital noise reduction of power sources. A wide range of media and formats are supported to suit various styles of DJ play. As well as smartphones/tablets, music files can also be played from USB storage devices such as flash memory and hard disks, SD memory cards, audio CDs and DVDs. MP3, AAC, WAV and AIFF file formats are supported. *2:Commercially available wireless LAN router separately required for Wi-Fi connection. *3:Works with music that has been beat-analyzed by “rekordbox™”. *4:Works with music that has been key-analyzed by “rekordbox™”. *5:Works with music that has been waveform-analyzed by “rekordbox™”. * iPhone, iPad, iPod touch, iTunes, Mac and Mac OS are registered trademarks of Apple Inc. in the United States and other countries. App Store is a service mark of Apple Inc.
* Android and YouTube are registered trademarks of Google Inc.
* rekordbox™ is a registered trademark of Pioneer Corporation. * Other trademarks and trade names are the property of their respective owners. * Other product, technology and company names, etc. mentioned herein are the trade names or registered trademarks of their respective owners.